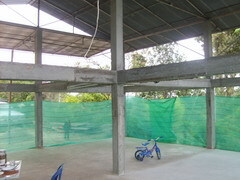 By July 3, our hostel building was built up to this level. 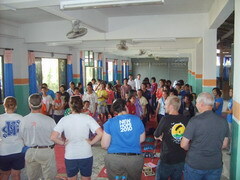 Thanks to all the friends who assisted so we could prepare this hostel building. 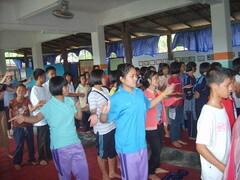 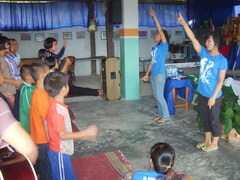 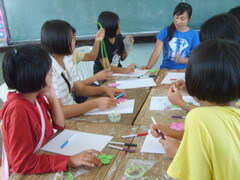 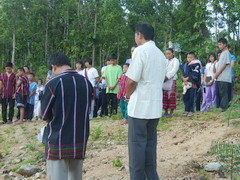 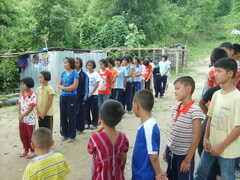 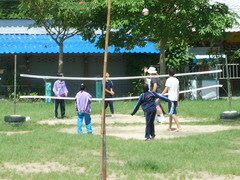 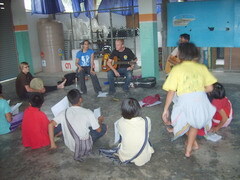 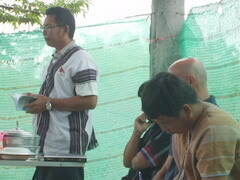 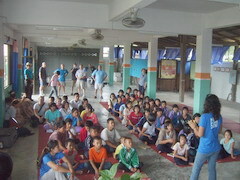 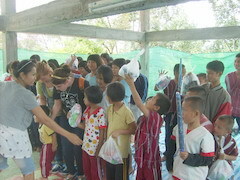 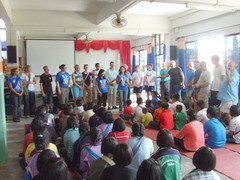 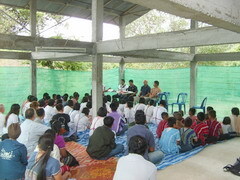 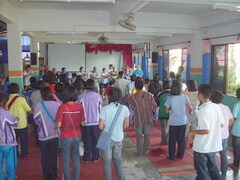 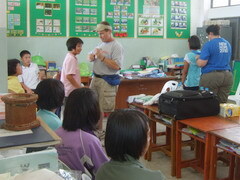 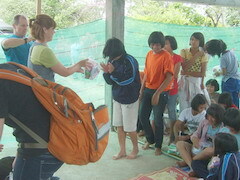 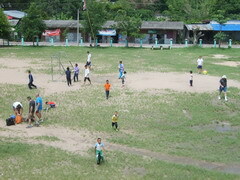 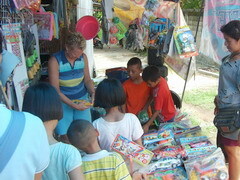 Friends from AAI began the activities on this morning. 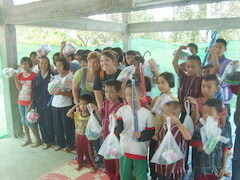 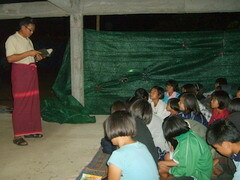 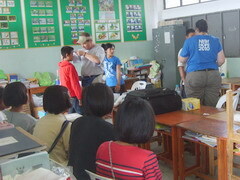 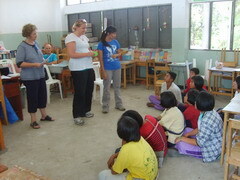 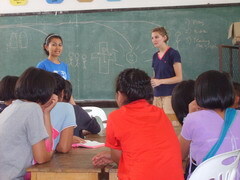 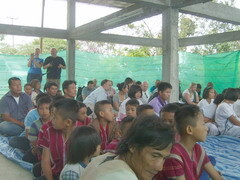 They started by introducing themselves to the children in the main conference room. 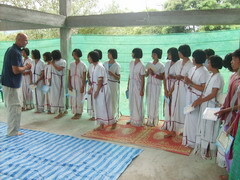 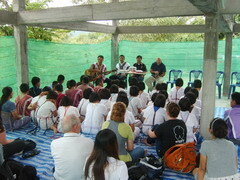 They sang together, and then the team divided their program activities to five sites: 1) Singing 2) Health checkup 3) Football 4) Ethics instruction 5) Rattan ball. 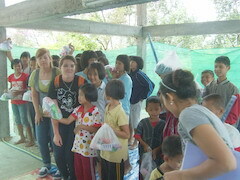 Each station took about forty minutes. 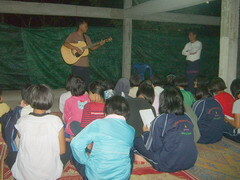 In the evening Rev. 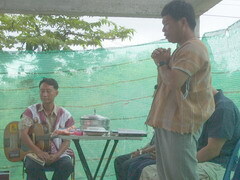 Tin Oo and Rev. 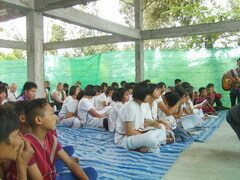 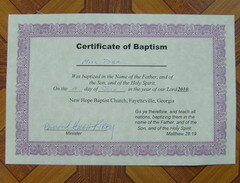 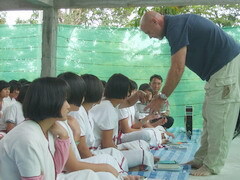 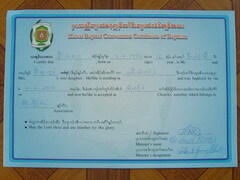 Joshua taught the meaning of baptism to children preparing for baptism. 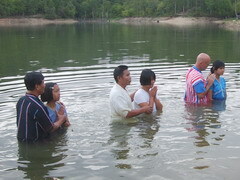 (Baptist doctrine requires that people understand the basic truths of The Gospel for baptism to be given. 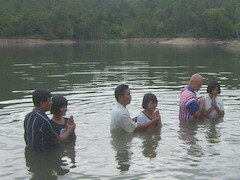 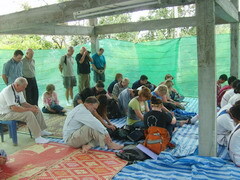 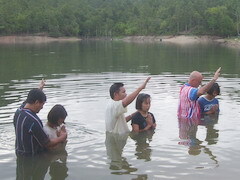 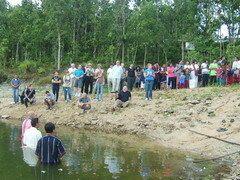 Sunday morning we went to the reservoir of Omkoi for the baptismal service. 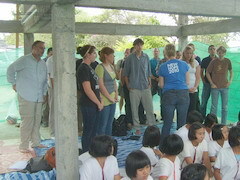 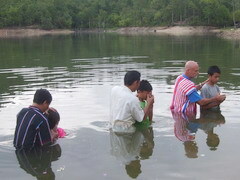 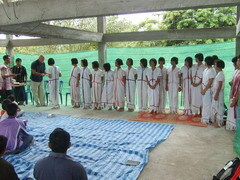 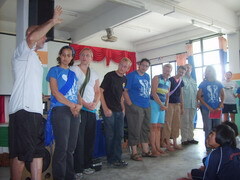 Parents of the children and team members from AAI encourage the children who are being baptized. 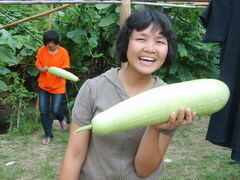 Gourd from our hostel back yard. 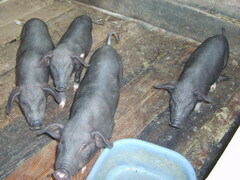 These pigs may become Christmas dinner. 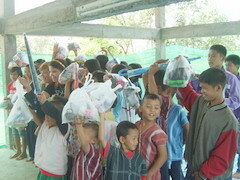 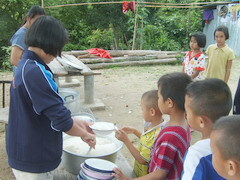 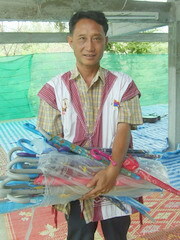 Every mealtime makes us think about canteens for the children, especially in the rainy season. 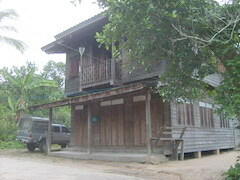 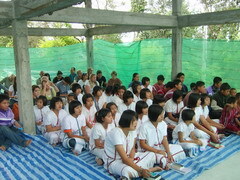 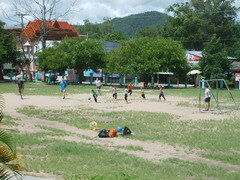 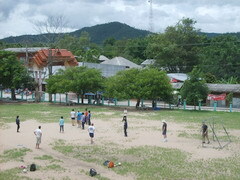 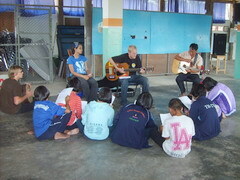 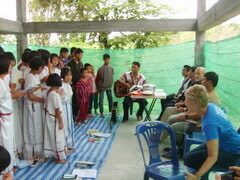 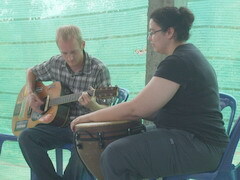 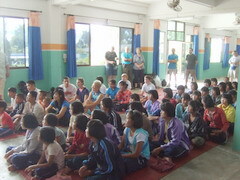 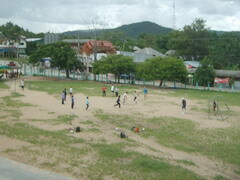 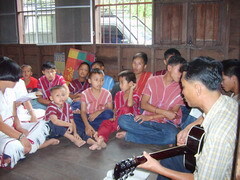 After the team from AAI returned to Chiangmai, we went to record songs in the house we rent for the boys. 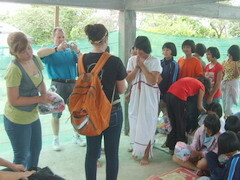 Before going back to Chiangmai we knew that Surasit, one of the students in our hostel who intended to get baptized, was very sick. 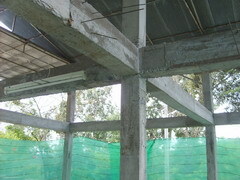 He was treated at Omkoi Hospital for many days, but the symptom did not improve. 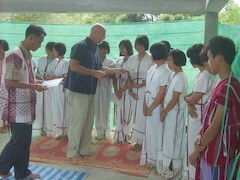 At that time dengue fever was epidemic. 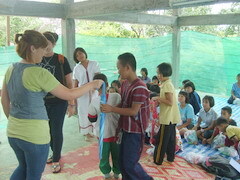 We noticed that Surasit was losing weight; he could not eat as much as he should be eating. 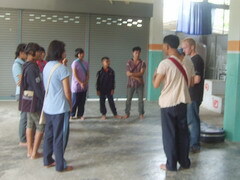 We brought him back with us to Chiangmai in the evening, together with Surachart another boy from our hostel. 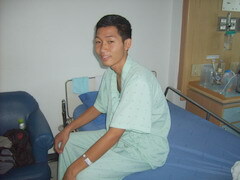 The next morning Surasit was quite dizzy so we took him to a private hospital in Chiangmai. 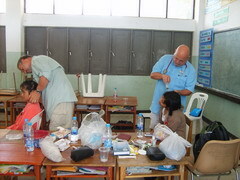 Experiences with emergencies like this have taught us that we should not go to a government hospital. 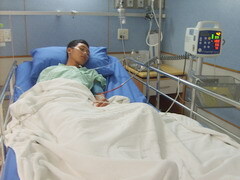 Because the procedure of government hospital might be too late for him. 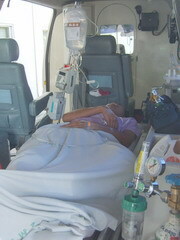 We have had the experience of choosing the wrong hospital, and patient died before treatment was started. 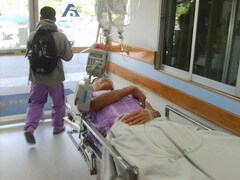 We decided to take him to a private hospital that has always been reliable, even though the cost is high. 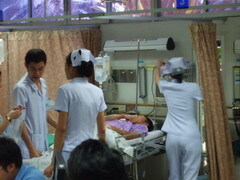 Lanna Hospital told us that his heartbeat was very weak and that he might be in shock. 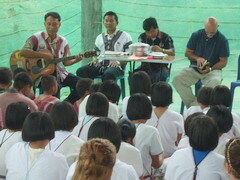 They treated him immediately, and after a detailed examination we were told that Surasit’s heart was inflamed. 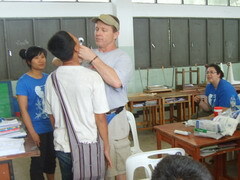 After diagnosis and treatment until he was improved, we moved him to a lower-cost hospital. 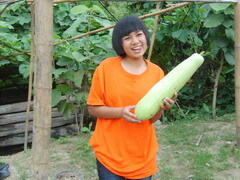 Thank God, finally Surasit is healed. 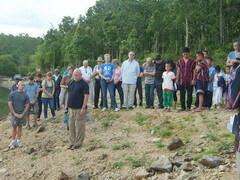 We thank Mr. Friedhelm Metzger for allowing us to shift money he had given us for a coffee mill in order to rescue Surasit’s life.